Hello everyone! Welcome to another blog hop with The Stamp Review Crew! This week we are featuring projects made using the Awesomely Artistic stamp set! I am your stop after the fabulous Shana Gaff! I just love this stamp set! And I think the name of it fits perfectly! I used the sketch from Freshly Made to help me create this card. And as you can tell, I was in a neutral mood - lol! Now it's time to send you on to see what the fabulous Dawn Tidd has created! Thanks for stopping by and have a super day! Clean and simply gorgeous! 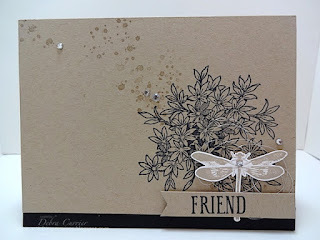 I love the Crumb Cake and black and the dragonfly behind the sentiment, it makes a striking card. 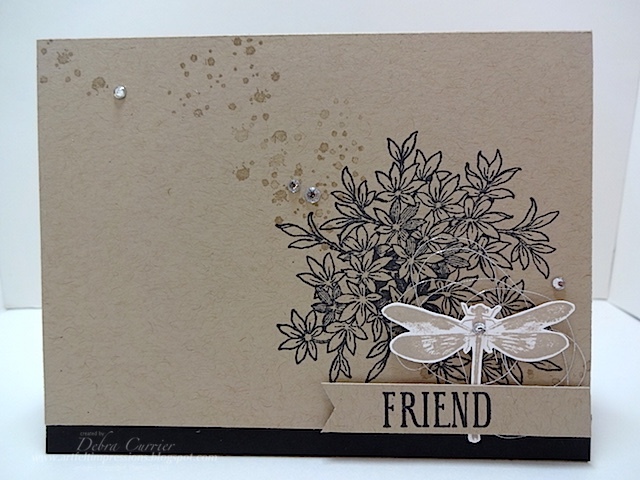 Love this done in neutral tones - the dragonfly is fabulous in white! This sketch is a great go-to and your image layering is perfectly showcased!! Love this! Debra, you accomplished something with this set I didn't think was possible. You created a masculine card! Very nice! Loving your neutrals colour palette Deb, so elegant in it's simplicity...Such a lovely project! Just so CAS and so beautiful. Love all the elements. It is nice to see an earthy/neutral background with this set. I love how you placed the dragonfly straight up and down. It's different and it works! This card is so beautiful! Sometimes neutrals are all you need! Beautiful card! I love using the neutrals. I like how clean it is too. Great card!